In an early meeting with the Save Darfur Coalition, their executive director announced, “Our mission is to put ourselves out of business.” We did our best to help them reach that goal. To bring the reality of suffering in Darfur closer to audiences, we developed a campaign that relied on eyewitness accounts from victims and survivors. The ads ran nationally in the U.S. and in 10 languages throughout Europe. 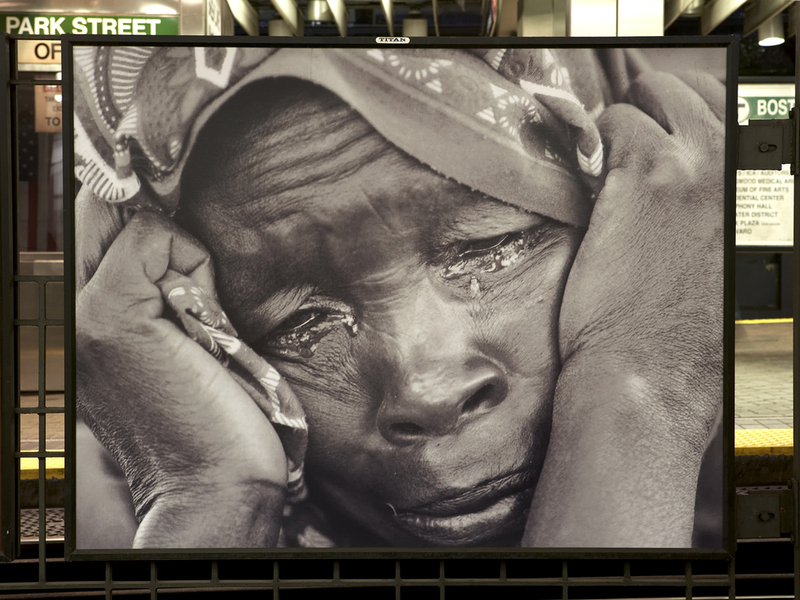 The campaign called on audiences to pressure their leaders to help bring peace to Darfur. The Save Darfur Coalition then launched an effort to rally U.S. support for divestment – encouraging institutional investors and brokerages to withdraw their investments from foreign companies whose dealings in Sudan were helping fuel the genocide. 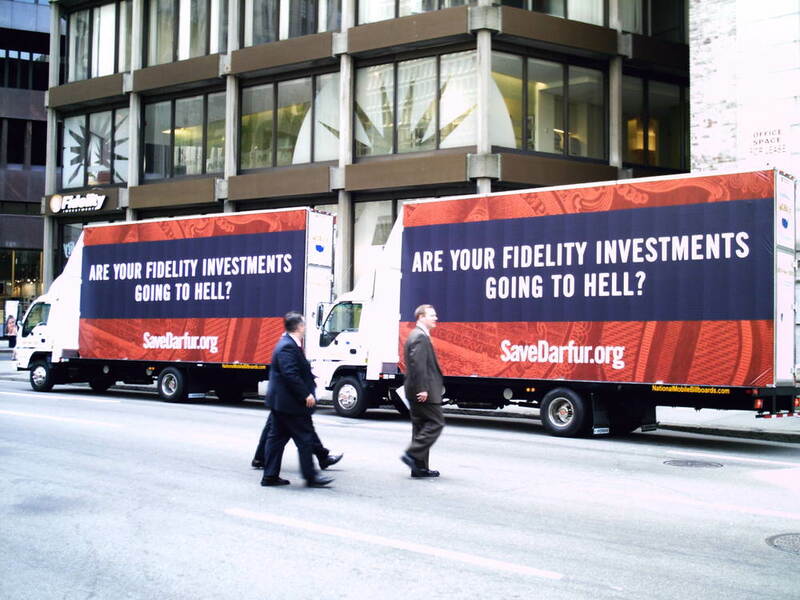 After repeated efforts to directly engage Fidelity Investments met with dismissive replies, Save Darfur decided to make those written replies public. To contrast Fidelity’s boilerplate language with the human tragedy on the ground, we traveled to a refugee camp in Chad to shoot ads featuring a young Darfuri woman and the actual letter from Fidelity. 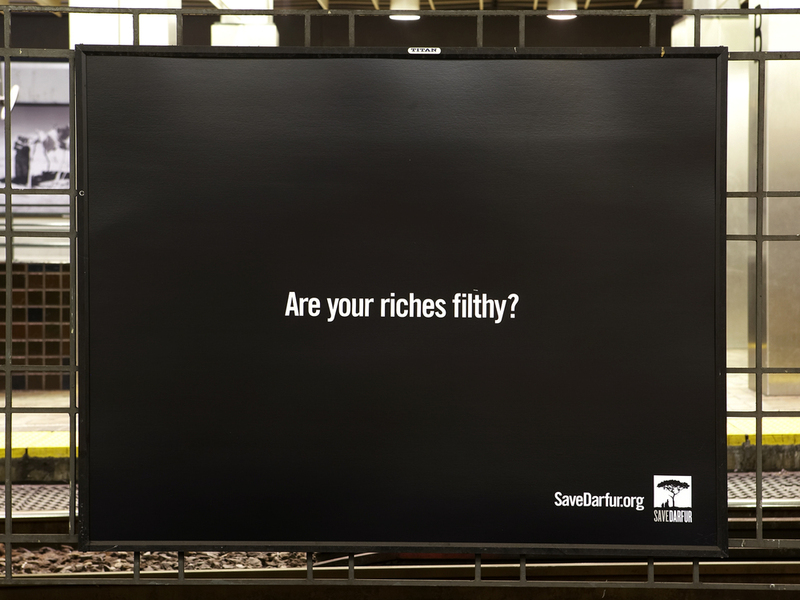 We also filled the subway station closest to Fidelity’s Boston headquarters with more than 130 transit ads. Outside the station, volunteers distributed leaflets while mobile billboards circled the streets around the company's offices. Shortly after the campaign launched, Fidelity’s financial filings quietly revealed they had sold more than 90% of their Sudan-related holdings. The campaign had received a great deal of press coverage, but Fidelity publicly denied having been influenced by our efforts. After subsequent campaigns aimed at Berkshire Hathaway and Franklin Templeton Investments, Save Darfur then appealed to individual investors. 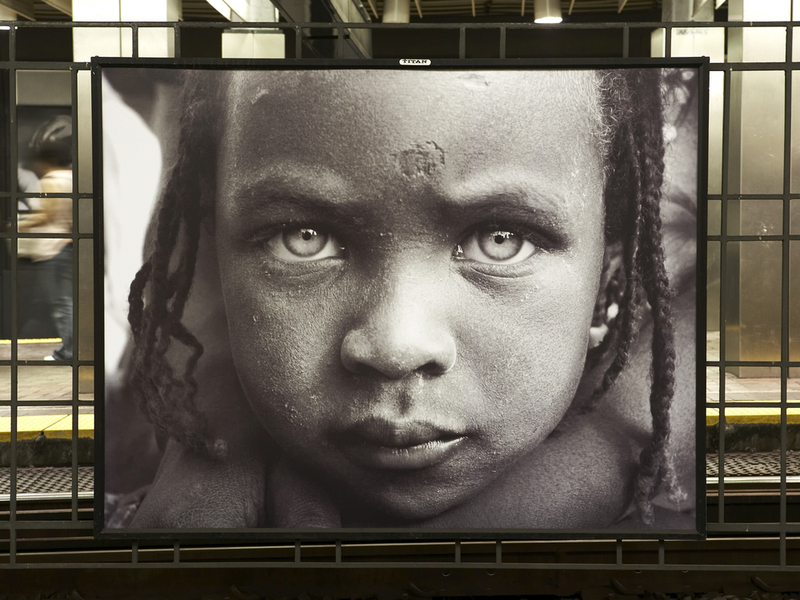 The advertising we created helped the Save Darfur Coalition reach tens of millions of people across the U.S., Europe, and the Arab world. During that time they raised millions of dollars in donations and grew their roster of volunteer activists to more than 800,000. In a face-to-face meeting with U.S. emissaries, the Sudanese government complained that our ads had “turned the world against them.” They didn’t intend it as a compliment, but we all took it as one. While the work met and exceeded the client’s expectations – garnering global attention and shaping the world’s opinion of a previously unknown conflict in a remote part of the world – it failed to put the Save Darfur Coalition out of business.